Posted on February 24, 2017 by Edge Leisure	in Newsfeed and tagged Edge Leisure, Home and Garden, Swimming Pools and Spas. There are magnificent hotel pools left right and centre, as you’ll know only too well if you’ve been keeping up with our most recent posts, and whilst the Infinity pool atop one Singapore hotel might just be the most inviting scene you ever did bear witness to, here at Edge Leisure, we believe in the luxury of the home pool in equal measures. Sure, we can’t magic up a cityscape backdrop or never-ending landscape of rolling fields to set your pool next to, but we can make them interesting, different and luxurious all their own right! If you’re thinking about getting a pool in this year, why not have a look at what these homeowners have done for ideas and inspiration! This stylish homeowner knows the key to a luxurious looking garden pool is all in the lighting. 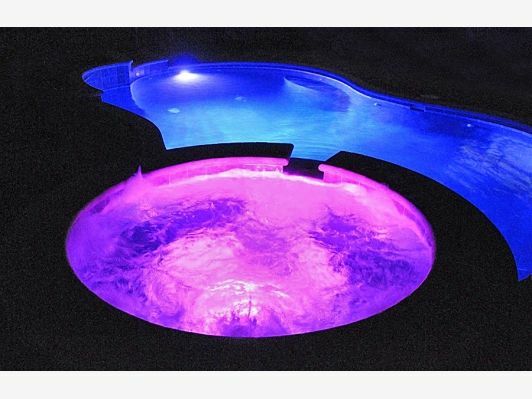 Whilst, in this pool, the owner has opted for two particularly bold colours, there’s limitless potential for what can be done, with underwater LEDS that deluge your garden in a swathe of measured light that instantly lends to the picture a degree of luxury! Themes are fun, especially when they’re done this well. Not only is this another brilliant demonstration of pool lighting, the rock-based surround and the waterfall make it distinct, inviting and a real departure from the norm. Think about adding a theme in to your swimming pool build, experiment with shapes and designs to find out what will suit your garden! A wooden decking surround? A contemporary, clean white? 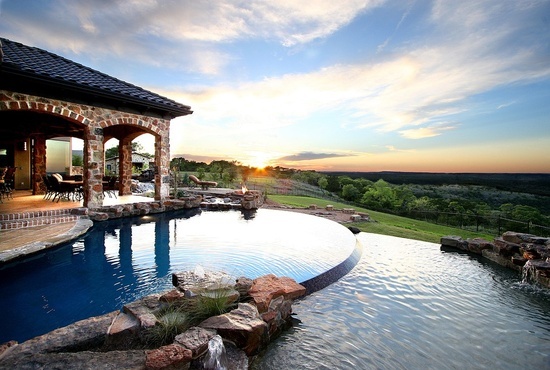 Positioning your pool right outside your doorstep might seem idealistic, but it could work well depending on your home. 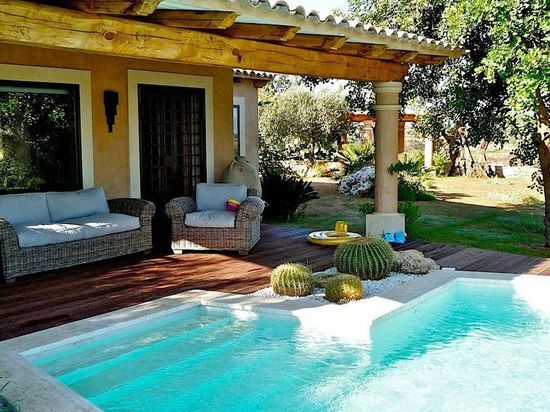 This rather quaint pool certainly manages to capture that ideal and make it work so remember to consider where you’d like yours located. Think about where it will get the most sun, and where would be convenient for you! Without wanting you to come thundering back to Earth, outdoor swimming pools in England at all but the height of summer are territory reserved for the brave. Fortunately though, there is an answer, as these clever folk in their swanky villa-esque home have found! Building an enclosure will mean you can enjoy your pool even during the bitterly harsh rain and cold of mid-June! Adding in some plants will also help create an outdoorsy atmosphere inside! And lastly, if you’re really looking to experiment, why not try something involving tiers and layers. It looks striking, unique and will certainly convey a sense of luxury! Our swimming pool builders will help you come to a decision on your garden swimming pool, offering advice and information of design and build possibilities until you’re happy! We’ve built home swimming pools in Gerrard’s Cross, Guildford, Oxford and all surround areas, so give us at Edge Leisure a call today!